The U.S. average retail price of diesel jumped 6.1 cents — the largest single increase of the year — to $3.104 a gallon as oil climbed past $68 a barrel amid signs the supply glut is fading. Trucking’s main fuel costs 50.7 cents a gallon more than it did a year ago, when the price was $2.597, the Department of Energy reported April 16. It was the fourth increase in diesel’s average price after six consecutive declines. The price has risen 13.2 cents in that period. The average price of diesel rose in all regions. The national average price for regular gasoline rose 5.3 cents to $2.747 a gallon, DOE’s Energy Information Administration said. The average is 31.1 cents higher than it was a year ago. Average gasoline prices were higher in every region. OPEC’s monthly oil market report for April noted strong freight growth was keeping the demand for diesel strong in the United States. Meanwhile, at least one diversified truckload carrier, M&M Cartage, is finding success by operating some trucks that run on diesel and others that use compressed natural gas. Louisville, Ky.-based M&M operates 275 heavy-duty trucks in all — 92 that run on CNG, with a couple more of those on order as it focuses on its goal of reaching 100. “We are still striving to do 10 million miles a year with CNG,” President Don Hayden said. The carrier uses about 10,000 gallons of diesel a day and about 6,000 gasoline-gallon-equivalents of CNG a day. Hayden said with diesel, he was not buying futures pricing and hadn’t for some time. Instead, M&M has arrangements for volume discounts with diesel fuel providers. “And then whatever goes on in the market, is what goes on in the market,” he said. Also, fuel surcharges are in place with all of its customers on all lanes, “even if it is a shorthaul,” Hayden said. 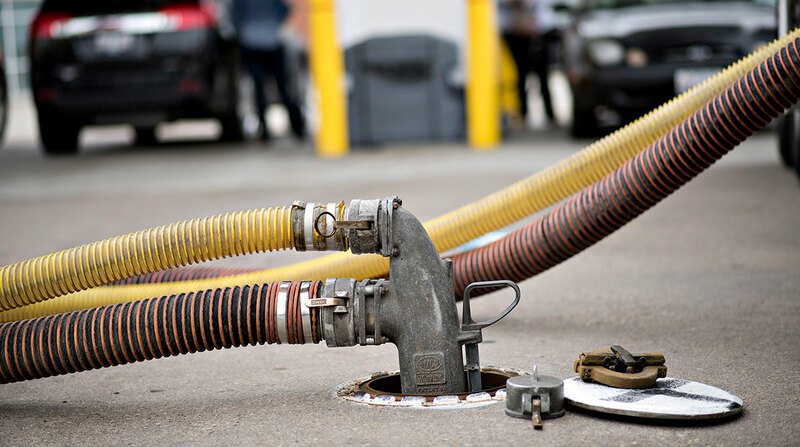 At the same time, M&M and other carriers fueling up with CNG stand to benefit in payloads from a recent congressional revision to federal legislation. Also, according to the revision, the single-axle, tandem-axle and bridge formula maximum weights may be exceeded by an amount that is equal to the difference between the weight of the vehicle attributable to the natural gas tank and fueling system carried by that vehicle; and the weight of a comparable diesel tank and fueling system, as long as the total gross vehicle weight does not exceed 82,000 pounds. “This ruling will now allow M&M greater flexibility to transport loads that we have previously declined or dispatched on diesel-powered tractors. We have several daily routes this will impact,” Hayden said. U.S. and Canadian natural gas Class 8 truck retail sales rose 13% in 2017 compared with a year earlier, ACT Research Co. reported in April. West Texas Intermediate crude futures on the Nymex closed at $66.22 per barrel April 16, compared with $63.42 on April 9. On April 18, the closing price was $68.47. It reached $69.20 early the next day. “Total commercial petroleum inventories decreased by 10.6 million barrels last week,” EIA also reported. Total motor gasoline inventories decreased by 3 million barrels last week but are in the upper half of the average range. Distillate fuel inventories — primarily ultra-low-sulfur diesel used in transportation and to a lesser degree as heating oil — decreased by 3.1 million barrels and are in the lower half of the average range for this time of year. OPEC and its partners are said to see excess stockpiles being wiped out faster than they were expecting, according to Bloomberg News. The global oil surplus shrank close to its five-year average, and supplies should come into balance with demand by the end of June, according to people with knowledge of data presented at a closed-door OPEC-led meeting in Saudi Arabia on April 19, Bloomberg reported. In the meantime, the weekly U.S. oil rig count was 815 during the week of April 13, seven rigs more than the week before and 132 more than a year earlier, oil field services company Baker Hughes Inc. reported. Houston-based Baker Hughes ranks No. 15 on the Transport Topics Top 100 list of the largest private carriers in North America.